"Habyarimana" redirects here. For the surname, see Habyarimana (surname). Juvénal Habyarimana (Kinyarwanda: [hɑbɟɑ̂ːɾimɑ̂ːnɑ]; French: [ʒy.ve.nal a.bja.ʁi.ma.na]; March 8, 1937 – April 6, 1994)) was the 2nd President of Rwanda, serving longer than any other president to date, from 1973 until 1994. He was nicknamed "Kinani", a Kinyarwanda word meaning "invincible". Habyarimana was a dictator, and electoral fraud was suspected for his unopposed re-elections: 98.99% of the vote on 24 December 1978, 99.97% of the vote on 19 December 1983, and 99.98% of the vote on 19 December 1988. During his rule, Rwanda became a totalitarian order in which his MRND-party enforcers required people to chant and dance in adulation of the President at mass pageants of political "animation". While the country as a whole had become slightly less impoverished during Habyarimana's tenure, the great majority of Rwandans remained in circumstances of extreme poverty. 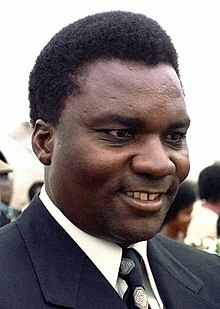 On April 6, 1994, he was killed when his aircraft, also carrying the President of neighbouring Burundi, Cyprien Ntaryamira, was shot down near Kigali, Rwanda. His assassination ignited ethnic tensions in the region and helped spark the Rwandan genocide. Juvénal Habyarimana was born on March 8, 1937 in Gisenyi, Ruanda-Urundi to a wealthy Hutu family. After receiving a primary education, he attended the College of Saint Paul in Bukavu, Belgian Congo, where he graduated with a degree in mathematics and humanities. In 1958 he enrolled in Lovanium University's medical school in Léopoldville. After the beginning of the Rwandan Revolution the following year, Habyarimana left Lovanium and enrolled in the officer training school in Kigali. He graduated with distinction in 1961 and became an aide to the Belgian commander of the force in Rwanda. He married Agathe Kanziga in 1962. In 1963 Habyarimana, due to his educated status and attractive personality, was appointed head of the Rwanda National Guard. That January he was promoted to the rank of major general. Two years later he was made Minister of the National Guard and Police. On July 5, 1973, while serving as Army Chief of Staff, Habyarimana seized power in a coup d'état against the incumbent President Grégoire Kayibanda and ousting Kayibanda's ruling Parmehutu party. In 1975, he created the Mouvement Révolutionaire National pour le Développement as the country's only legal party. The government stayed almost entirely in military hands until 1978, when a new constitution was approved in a referendum. At the same time, Habyarimana was elected to a five-year term as president. He was reelected in single-candidate elections in 1983 and 1988. A Hutu himself, he initially won favor among both Hutu and Tutsi groups given his administration's reluctance to implement policies that catered to his primarily Hutu supporters. This restraint did not last and Habyarimana eventually began to oversee a government that mirrored the policies of Kayibanda. Quotas were once again applied to jobs for "universities and government services" which intentionally disadvantaged Tutsis. As Habyarimana continued to favor a smaller and smaller coterie of supporters, the more Hutu groups —slighted by the nation's leader— cooperated with Tutsis to weaken his leadership. By the start of the invasion from Uganda by the army of the Rwanda Patriotic Front, a rebel army made up mostly of refugee Tutsi who had helped Uganda's Museveni seize control of the presidency, Habyarimana's supporters had shrunk down to the akazu ("little house" or "President's household"), which was mainly composed of an informal group of Hutu extremists from his home region, namely from the northwestern provinces of Gisenyi and Ruhengeri. From 1975 to 1990, the MRND and the Habyarimana government were one. Local administrations simultaneously represented the official party as well as the local authority. Legal and party policies were communicated and enforced from the Head of State down through the local administrative units, especially the general policy of Umuganda where Rwandans were required to "allocate half a day's labour per week" to infrastructural projects. Habyarimana is sometimes described as a moderate though the party is said to have used right-wing propaganda methods, advanced a conservative political agenda and was anti-communist. However, in 1990, before the Rwandan Patriotic Front (RPF) invasion, and because of mounting pressure from several sources—Rwanda's main ally and financial backer, France, its main funders, the IMF and the World Bank, and from its own citizens wishing for a greater voice and economic change—he agreed to allow the formation of other parties such as the Republican Democratic Movement, the Social Democratic Party, the Liberal Party and the Christian Democratic Party. In October 1990, an invasion against Habyarimana's government began when rebels from the RPF, a force of mostly Tutsi Rwandan refugees and expatriates who had served in the Ugandan army (many in key positions), crossed the border from Uganda. The French and Zairian military intervened on behalf of Habyarimana's government forces, and a troubled ceasefire was officially reached through the Arusha Accords. On April 6, 1994, Habyarimana's private Falcon 50 jet was shot down near Kigali International Airport, killing Habyarimana. Cyprien Ntaryamira, the President of Burundi, the Chief of Staff of the Rwandan military, and numerous others also died in the attack. The plane crashed on the grounds of the presidential residence. The circumstances of the crash remain unclear. At the time, the Hutu Power media claimed the plane had been shot down on orders from RPF leader Paul Kagame. Others, including the RPF, accused militant Hutus from within Habyarimana's party of orchestrating the crash in order to provoke anti-Tutsi outrage while simultaneously seizing power. Since the aircraft had a French crew, a French investigation had been conducted; in 2006 it concluded that Kagame was responsible for the killing and demanded that he be prosecuted. The response from Kagame, the de facto leader of Rwanda since the genocide, was that the French were only trying to cover up their own part in the genocide that followed. A more recent French probe in a January 2012 report was falsely reported to exonerate the RPF. Members of Kagame's inner circle have come out publicly stating that the attack was ordered by Kagame himself. These include his former chief of staff and ambassador to the United States Dr. Theogene Rudasingwa, the former army chief and ambassador to India General Kayumba Nyamwasa, the former secretary in the ministry of defense Major Jean-Marie Micombero, and others. At some point following the April 6, 1994 assassination, Habyarimana's remains were obtained by Zairian President Mobutu Sese Seko and kept in a private mausoleum in Gbadolite, Zaire (now the Democratic Republic of the Congo). Mobutu promised Habyarimana's family that his body would eventually be given a proper burial in Rwanda. On May 12, 1997, as Laurent-Désiré Kabila's ADFL rebels were advancing on Gbadolite, Mobutu had the remains flown by cargo plane to Kinshasa where they waited on the tarmac of N'djili Airport for three days. On May 16, the day before Mobutu fled Zaire (and the country was renamed the Democratic Republic of the Congo), Habyarimana's remains were burned under the supervision of an Indian Hindu leader. The death of Habyarimana ignited a murderous spree by extremists from the majority Hutus against Tutsis and those Hutus who had opposed the government in the past or who had supported the peace accords. Within 100 days, somewhere between 800,000 and 1 million Rwandans were massacred. Habyarimana's wife, Agathe Habyarimana, was evacuated by French troops shortly after his death. She has been described as having been extremely influential in Rwandan politics. She has been accused by Rwandan justice minister Tharcisse Karugarama of complicity in the genocide and was denied asylum in France on the basis of evidence of her complicity. She was arrested March 2010 in the Paris region by the police executing a Rwandan-issued international arrest warrant. In September 2011, a French court denied Rwanda extradition of Agathe Habyarimana. Juvénal Habyarimana was a devout Roman Catholic. ^ Akyeampong & Gates 2012, pp. 527–528. ^ a b c Philip Gourevitch (1998). We Wish to Inform You That Tomorrow We Will Be Killed With Our Families. ^ a b Akyeampong & Gates 2012, p. 527. ^ a b Akyeampong & Gates 2012, p. 526. ^ a b c The Prosecutor versus Jean-Paul Akayesu , ICTR-96-4-T (International Criminal Tribunal for Rwanda 1998). ^ Murphy, Sean D. 'Humanitarian intervention: Volume 21 of Procedural aspects of international law series'. University of Pennsylvania Press, 1996. ISBN 0812233824, 9780812233827 Length 427 pages. Page 243. ^ Bonner, Raymond (12 November 1994). "Unsolved Rwanda Mystery: The President's Plane Crash". The New York Times. p. 1. Retrieved 26 December 2018. ^ "Rwanda fury at Kagame trial call". BBC News. 21 November 2006. ^ Epstein, Helen C. (12 September 2017). "America's secret role in the Rwandan genocide". The Guardian. ^ Reyntjens, Filip (21 October 2014). "Rwanda's Untold Story. A reply to "38 scholars, scientists, researchers, journalists and historians"". African Arguments. ^ "Shikama: Rwanda.RNC Leader Theogene Rudasingwa Testifies Against Rwandan Paul Kagame in Spanish High Court". Retrieved 21 July 2016. ^ "Rwanda Opposition Furious Over Habyarimana Plane report". Retrieved 21 July 2016. ^ French, Howard W. (16 May 1997). "Ending a Chapter, Mobutu Cremates Rwanda Ally". The New York Times. Retrieved 26 December 2018. ^ See, e.g., Rwanda: How the genocide happened, BBC, April 1, 2004, which gives an estimate of 800,000, and OAU sets inquiry into Rwanda genocide Archived February 25, 2007, at the Wayback Machine, Africa Recovery, Vol. 12 1#1 (August 1998), page 4, which estimates the number at between 500,000 and 1,000,000. 7 out of every 10 Tutsis were killed and they lost the war. ^ "Blazing a trail for Africa's women". BBC News. 23 November 2005. Retrieved 2008-02-08. ^ "Rwanda seeks ex-first lady arrest". BBC News. 11 January 2007. Retrieved 2008-02-08. Wikimedia Commons has media related to Juvénal Habyarimana.